The Pier to Forever: Read Chapter Five of Otoro Queril: Saeire Insu Executioner! Read Chapter Five of Otoro Queril: Saeire Insu Executioner! SITTING IN the kitchen, Otoro wrote on a small bit of paper with an odd pen. “What strangely colored ink. It looks like blood! What language is that?” asked Firr. Firr nodded gravely, but the happiness he exuded at the news of the Sankyan did not go away. They left the kitchen, fetched the bow and bird, and stepped out the back door into the yard. There was a tiny clearing directly above; the slight yellow glow of city lights coldly graced the lowest of the low clouds and peeked through the tree canopy. Ammalinaeus was out there, but Otoro hadn’t seen it in many months. It was like Aquanus was trying to cover the infected wound that was Imperium Centrum. Firr stuck his index out. “Come here, little one,” said Firr kindly. The bird gave a tweet and jumped down to his finger. He gently stroked its tiny head. Firr closed his eyes. A moment passed in silence, interrupted only by a breeze that rustled weakly through the thick boughs above. The bird gave a stronger tweet, and then began sparkling out of existence. Firr opened his eyes and gawked. The sparkles lengthened and brightened, flowing into each other in a long shaft that solidified and dropped from his finger, which Otoro caught. Otoro fitted the Arrowsparrow and lifted the bow. The arrow that was a bird was beautiful, streaked blue and gold, its colors plain even in the dark. Otoro lowered the weapon, handed it over. Firr hefted it with practiced skill, even with a finger missing on his left hand. He aimed up through the small gap in the trees, pulled back on the bow with surprising strength, and released the Arrowsparrow, which disappeared instantly up and away. He lowered the bow and handed it back. “I report back for duty in three days,” said Otoro. “I’ll be back here in the late afternoon indefinitely, however. It’ll take months to build new barracks.” He stopped, stared. Senior Tracluse were given significantly more freedom and privileges than their underlings. One was the freedom to claim as many as three slaves to themselves. To that end they were given personalized brands to mark the slaves as their own. Firr insisted on stoking the fire himself and seeing to the brand, which was, thankfully, relatively small, maybe half the length of his thumb and no wider. He lifted the iron and inspected the cherry-red end. “It’s close enough,” he said. He had already stripped his shirt off. His chest and back were covered in scars. Firr stared at it, and then, with surprise, at the small first-aid kit at Otoro’s feet. Otoro did. 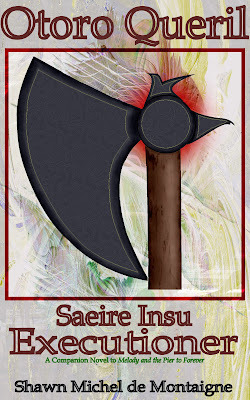 As swiftly as he swung his axe, he snatched Firr’s wrist and in the same motion twisted it and brought the brand down on his forearm. He held the cherry-red end on the flesh for only half a second, and concluded the action by tossing the iron back into the fire. Firr bellowed and instinctively tried to pull away, but Otoro kept a firm grip on him. He released him when he was sure it was safe to do so, and then reached for the salve and applied it liberally over the burn, which smoked and blistered grotesquely as he watched. Otoro went into the study, then back into the closet, where he lifted the hidden hatch. He fished out a small box, replaced the hatch, and marched back to the kitchen. He sat and opened the box and selected a small, blank roll of paper the same size as the one that he’d attached to the Arrowsparrow they’d shot off. While Firr watched, he took a small pick and pricked his middle finger, then swiped the bead of blood over the paper, which he handed to him. Firr released his branded arm, took the paper and stared at it. The blood smear had disappeared, replaced with strange letters of the same color. He went to hand it back. “No. Look at it again,” Otoro ordered. Firr looked. His eyes went wide. He brought it up close. As Otoro made dinner, and as Firr sat there, listening, Otoro told him more about Arrowsparrows and messaging, and then more about the Saeire Insu, and then what happened to the king, Conor Kieran: his encounter with the Pier god in the Temple Kentein Intersectum, how the god bestowed upon him the legendary Pearl-Yang Serpenthelm, and how he told the king to sail east for the Tangent and to accept mutineers from other countries, as he did. Once at the Tangent, Conor Kieran and his mutineers turned to fight the overwhelming Gyssian Navy, and he defeated them. Dinner had been served: buttered biscuits and fish pottage with vegetables. They sat across from one another, and for that moment, their meals were forgotten as they stared at each other. A long silence followed. Firr ate his meal with a bewildered, disbelieving, bloodless visage. He didn’t blink. Otoro doubted that he tasted anything. “Huh,” grunted Firr, and shook his head. “They’re branded just as you are, but in here—” Otoro pointed stiffly at his temple—“and in here.” He brought a hard fist to his heart. The old man went about finishing up his meal. Otoro had long since finished his; the two lapsed into more silence. “Do you believe in God?” asked Firr from the quiet. Firr lowered his spoon and studied the undersides of his forearm. The fresh brand was flaky white outlined in blood-cracked black. Tears filled his eyes. Otoro watched him steadily. or click the link below the cover to download it at Payhip!